Bottled nature. 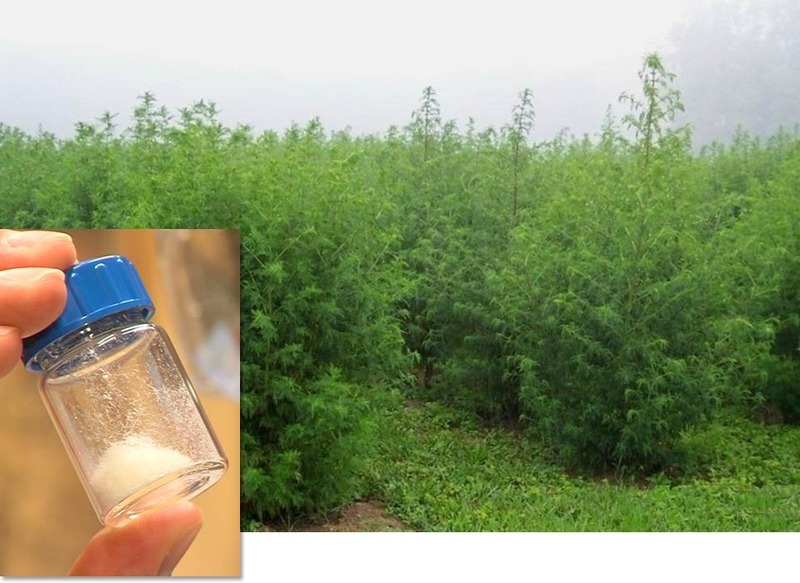 Production of the antimalarial drug artemisinin (inset) still involves planting sweet wormwood and extracting the compound. Artemisinin, a crucial drug in the global fight against malaria, could soon become cheaper and easier to make, thanks to researchers who have found a better way to synthesize the compound. "The impact of this is hard to overestimate," says Jack Newman, an industrial chemist at Amyris Biotechnologies in Emeryville, California, who was not involved in the work. According to the World Health Organization (WHO) 655,000 people died of malaria in 2010, "and while there is a cure," Newman says, "the supply chain to make artemisinin has been a huge problem." Artemisinin is naturally produced by a plant called sweet wormwood (Artemisia annua), which has been used for centuries in traditional Chinese medicine. In 1972, pharmaceutical scientist Tu Youyou, as part of a project for the Chinese government, identified the active compound, a discovery for which she was honored with the Lasker-DeBakey Clinical Medical Research Award last year. Since 2001, WHO has recommended that so-called artemisinin-based combination therapies (ACTs)—in which artemisinin is combined with another drug—replace older, ineffective drugs worldwide. These combinations have become a cornerstone of malaria control and are believed to have saved many lives. Synthesizing artemisinin from scratch has been too costly and cumbersome so far, however, and the plant holds only a tiny fraction of artemisinin—between 0.001% and 0.8%. As a result, ACTs still cost between $1 and $2 per treatment course, which is a problem; poor patients who buy their own drugs often choose cheaper but less effective alternatives. But sweet wormwood also produces artemisinic acid, a related molecule; during the extraction of 1 kilogram of artemisinin, as much as 10 kilograms of artemisinic acid is produced, which is currently thrown away because its conversion into artemisinin is not cost-effective. Now, chemist Peter Seeberger and his postdoc François Lévesque at the Max Planck Institute of Colloids and Interfaces in Potsdam, Germany, say they may have conquered that problem. Artemisinin's activity depends on its so-called endoperoxide group, a bridge of two oxygen atoms that spans one of the molecule's three rings. To make artemisinin from artemisinic acid, chemists need to create the bridge by introducing reactive oxygen molecules called singlet oxygen. This can be done by shining light on "normal" oxygen molecules, a process known as photochemistry. Scaling up this procedure to an industrial level is hard, however, because the bigger reaction the vessels get, the less light they let in and the less reactive oxygen is produced. Seeberger and Lévesque bypassed that problem by using so-called flow chemistry, in which the reactions happen while the chemicals are flowing through a thin tube. By wrapping the tube around the light source, they dramatically increased the volume in which reactive oxygen is produced. In a first step, artemisinic acid is reduced to dihydroartemisinic acid. This product and oxygen are pumped into the tube, where they mix; the light then activates the oxygen, which reacts with the acid to produce a precursor of artemisinin. Then the team adds trifluoroacetic acid to the mix, cleaving a carbon ring in the molecule, which then reacts with the molecular oxygen in the tube to produce artemisinin. The yield after purification is about 40% , the researchers report this week in Angewandte Chemie. "The whole reaction takes 4½ minutes, and we can now produce 800 grams of artemisinin a day with this little machine," Seeberger said yesterday at a press conference in Berlin, where he showed a suitcase-sized prototype of the reaction system. "In 3 months, we want to be able to produce 2 kilograms a day with this," he added. Seeberger says his first reactor cost about $60,000 to produce, but a new one would cost only $12,000, and the price could come down to $10,000. "This is a good piece of science", says Geoff Brown, a chemist studying artemisinin at the University of Reading in the United Kingdom. Seeberger has patented the technology but has not talked to pharmaceutical companies yet. "That starts today," he said at the press conference. He hopes that his discovery will allow much more artemisinin to be extracted from the plants. That would not solve another issue in artemisinin production, however. "The real problem with the crop is that you have to forecast your need 14 months in advance," Newman says, "because that is the time it takes to plant and harvest the plants and extract artemisinin." The resulting volatility in prices has driven many farmers to other crops. Because of this, Newman says, the finding will have the biggest impact in combination with artemisinic acid production from other sources. Amyris has engineered yeast to produce artemisinic acid, and Sanofi is planning to produce 10 tons of artemisinin—enough for some 20 million treatments—from it this year. Although the details of this work are not public, there have been reports of problems with the conversion from artemisinic acid to artemisinin. "I would suspect that the continuous conversion of artemisinic acid to artemisinin, which is outlined in Seeberger's paper, may be a substantial improvement," Brown says.